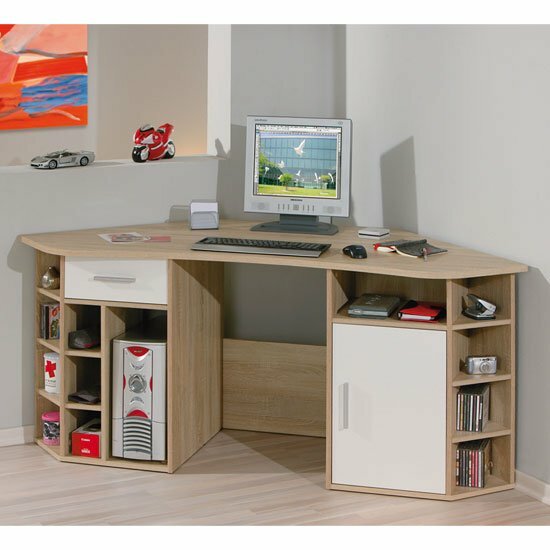 Corner computer desks are designed specifically for small spaces. By carefully optimizing your corner space and using every centimeter available in the corners, you get a chance to open up plenty of room in the middle of the room. This way, even the tiniest room seems more spacious than it actually is, so any corner furniture a great idea for small premises. However, any time you are looking for corner furniture, you should bear the basic interior decoration guideline in mind – all of your pieces should be carefully combined together. In other words, decoration pattern should remain consistent, and even if you mix certain styles, you should make sure that the general design pattern remains logical and easy-to-follow. If you have a laptop and do not need a keyboard tray or any extra storage space, a simple worktable might be enough for you. A basic corner table with nothing but table surface and legs can serve as a fully functional computer desk. Another simple model is a table surface with a keyboard tray below – nothing else. This is a very space-efficient solution – provided you are not looking for storage. To ensure better functionality, it is advisable to look for desks with drawers – do not forget that even in our digitalized word, papers still tend to accumulate next to our working spots. A cabinet is another solution that can give you a chance a keep some of your documents at hand. Plus, corner cabinets are very spacious. Upper shelves can be great for keeping CDs, books, or simply trinkets – whatever you need by your side when you work. Surely, there are different assemblies that can feature cabinets, drawers, or shelves – depends on the model. A drawer and a cabinet to the right or to the left is the most widespread type. Trolleys, or compact computer desks that can be moved, are less widespread, but also highly functional. Ladder-like models can also prove useful in certain interiors. All of the above-mentioned desks can be found in Furniture in Fashion store. The selection of materials and designs in this online store is also very impressive, which is not at all surprising given that this is one of the biggest e-commerce furniture platforms in the UK. So, if you hope to find a model that would satisfy all of your demands quickly, you should probably give the store a try.